The Museum of Contemporary Art of Panama (MAC) is proud to present the exhibition “Preguntas al Espejo” (“Questions to the Mirror”), recent works by the Cuban American artist, Gustavo Acosta. Opening reception will be on Thursday, June 25th, 2009, 7:30 p.m., with the artist present. Progressively more abstract, his nocturnal views or his city landscapes “present an intimate code to express memories, nostalgia, and emotions inherent in his art – isolation, yearning, estrangement, fear, hope and fantasy. The spaces he creates are carefully delineated, totally believable, but somehow not quite correct. They are drawn and painted with exactitude so, in an almost voyeuristic way, we are able to see down into the streets and coastlines from above – as if we have the power as viewers to manipulate what is happening. But we see no people. We have no clues. We cannot be sure if it is night or day, or where we are. Are we looking at ourselves, our lives and the story of our existence? Is this the mirror we question with the artist? Undoubtedly the sense of loss relates to his homeland of Cuba , which he left in 1991 for Mexico , then Spain , and finally to Miami , where he now resides. Cuba is the place on his maps. Even when it is another location represented, it is Cuba that was the first place and from which he began his journey into the exploration of cities and seas – real and imagined. It is Cuba that he painted to capture and preserve its history and memory. Only after many many images of the beautiful city and its land and sea, could he venture forth to create other places, now significant to his life. In this exhibition, we recognize Havana and Miami and fragments of places that can be anywhere, aerial views with that implied human presence that are now broader and more universal. Emblematic elements may associate them with certain places. However, more often the runways of one city’s airport are as indistinguishable as its crowded inner neighborhoods. The distant becomes familiar, but not recognizable. The urban environment becomes a theater, a stage set for relationships that play out beneath us, without sharing the intimacies we crave to know from above. The lives are puzzles, as much as the labyrinth of the city’s grid is only a suggestion for our journey within that is difficult to begin and more difficult to complete. (Dr. Carol Damian, from the catalogue “Questions to the Mirror”). Gustavo Acosta was born in Havana , Cuba (1958), and works and lives in Miami since 1992. He studied at the acclaimed School of Visual Arts of San Alejandro and the Instituto Superior de Arte (ISA). The recipient of numerous awards, Gustavo Acosta is one of the leading artists of his generation. His works have been shown in solo and group exhibitions in the United States , Europe, and Latin America , and they are part of the permanent collections of important museums and private collections around the world. 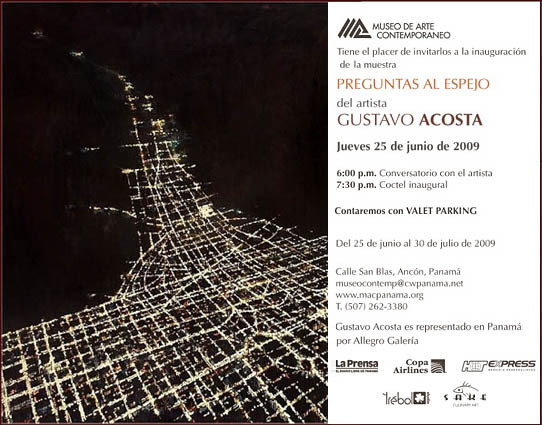 Gustavo Acosta is represented in Panama by Allegro Galeria. “Preguntas al espejo” presents a group of sixteen paintings and two drawings, as well as a video, produced by Gustavo a Zoé Valdés as a testimony of the artist’s process. A fully illustrated catalogue, in Spanish and English will be available, and includes essays by Dr. Carol Damian, Director and Curator of The Patricia and Phillip Frost Art Museum , Miami , Florida , and by guest curator, Mirie de la Guardia. Sponsored by: Corporación La Prensa, Hot Express, COPA Airlines, Restaurante Sake.